Volume 3, Medical Emergencies, covers medical emergencies and includes updated material that is consistent with the 2015 American Heart Association Guidelines for Cardiopulmonary Resuscitation and Emergency Cardiovascular Care. New information is included on Ebola, Zika, and Chikunyaga virus disease, as well as updated toxic syndromes and drugs of abuse tables, and a new section on cardiac arrest in pregnancy. This title is also available with MyBRADYLab—an online homework, tutorial, and assessment program designed to work with this text to engage students and improve results. Within its structured environment, students practice what they learn, test their understanding, and pursue a personalized study plan that helps them better absorb course material and understand difficult concepts. Dr. Bryan Bledsoe is an emergency physician, researcher, and EMS author. Presently he is Professor of Emergency Medicine and Director of the EMS Fellowship program at the University of Nevada School of Medicine and an Attending Emergency Physician at the University Medical Center of Southern Nevada in Las Vegas. He is board-certified in emergency medicine. Prior to attending medical school, Dr. Bledsoe worked as an EMT, a paramedic, and a paramedic instructor. He completed EMT training in 1974 and paramedic training in 1976 and worked for six years as a field paramedic in Fort Worth, Texas. In 1979, he joined the faculty of the University of North Texas Health Sciences Center and served as coordinator of EMT and paramedic education programs at the university. Dr. Bledsoe is active in emergency medicine and EMS research. He is a popular speaker at state, national, and international seminars and writes regularly for numerous EMS journals. He is active in educational endeavors with the United States Special Operations Command (USSOCOM) and the University of Nevada at Las Vegas. Dr. Bledsoe is the author of numerous EMS textbooks and has in excess of 1 million books in print. Dr. Bledsoe was named a “Hero of Emergency Medicine” in 2008 by the American College of Emergency Physicians as a part of their 40th anniversary celebration and was named a “Hero of Health and Fitness” by Men’s Health magazine as part of their 20th anniversary edition in November of 2008. He is frequently interviewed in the national media. Dr. Bledsoe is married and divides his time between his residences in Midlothian, TX, and Las Vegas, NV. Richard Cherry is a Training Consultant for Northern Onondaga Volunteer Ambulance (NOVA) in Liverpool, New York, a suburb of Syracuse. He is also a program reviewer for The Continuing Education Coordinating Board for Emergency Medical Services (CECBEMS). He formerly held positions in the Department of Emergency Medicine at Upstate Medical University as Director of Paramedic Training, Assistant Emergency Medicine Residency Director, Clinical Assistant Professor of Emergency Medicine, and Technical Director for Medical Simulation. His experience includes years of classroom teaching and emergency fieldwork. A native of Buffalo, Mr. Cherry earned his bachelor’s degree at nearby St. Bonaventure University in 1972. He taught high school for the next ten years while he earned his master’s degree in education from Oswego State University in 1977. He holds a permanent teaching license in New York State. Mr. Cherry entered the emergency medical services field in 1974 with the DeWitt Volunteer Fire Department, where he served his community as a firefighter and EMS provider for more than 15 years. He took his first EMT course in 1977 and became an ALS provider two years later. He earned his paramedic certificate in 1985 as a member of the area’s first paramedic class. He then worked both as a paid and volunteer paramedic for the next 15 years. Mr. Cherry has authored several books for Brady. 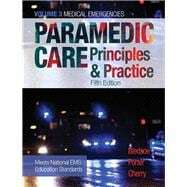 Most notable are Paramedic Care: Principles & Practice, Essentials of Paramedic Care, Intermediate Emergency Care: Principles & Practice, and EMT Teaching: A Common Sense Approach. He has made presentations at many state, national, and international EMS conferences on a variety of EMS clinical and teaching topics. He and his wife, Sue, reside in Sun City West, Arizona. In addition to riding horses, hiking, and playing softball, they volunteer their time at Banner Del Webb Medical Center. Mr. Cherry also plays lead guitar in a Christian band.